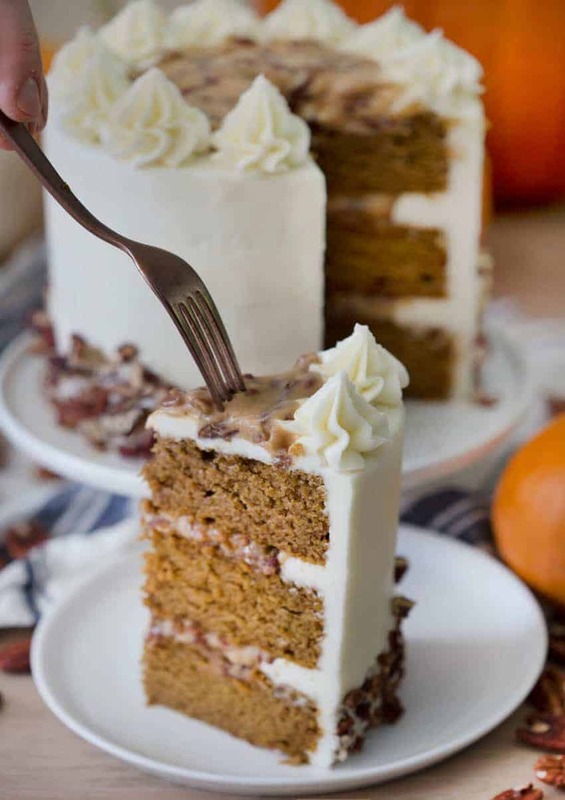 This moist and spicy pumpkin cake is filled with an intoxicating toasted pecan caramel filling and covered in a perfect vanilla buttercream. I love the play of super-soft, pillowy cake with the crunch of nuts and creaminess from the filling. This is a piece of pumpkin heaven for all you German chocolate cake lovers! 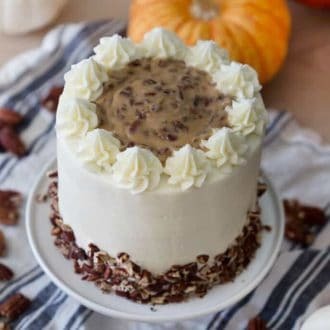 Moist pumpkin cake spiced with cinnamon, ginger, allspice et al is filled with a luscious pecan frosting and surrounded by vanilla buttercream and more toasted pecans. 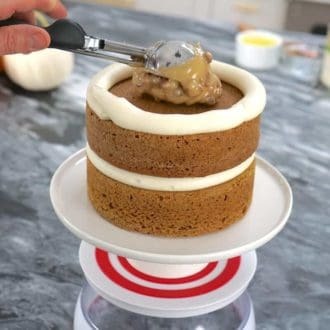 This would also work as a naked cake with just the pecan frosting OR you could pair it with with the browned buttercream from my pumpkin poke cake. 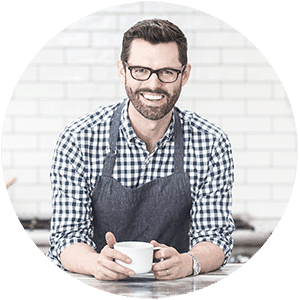 This recipe actually makes a good deal of batter so you should be fine using 3 eight inch pans. I used six inch rounds and had enough left over batter for a good number of pumpkin cupcakes! Make sure to toast your pecans, it makes all the difference! Use pumpkin purée, not canned pumpkin pie filling. You can make the cake layers a day ahead; just wrap them up and keep at room temp overnight. 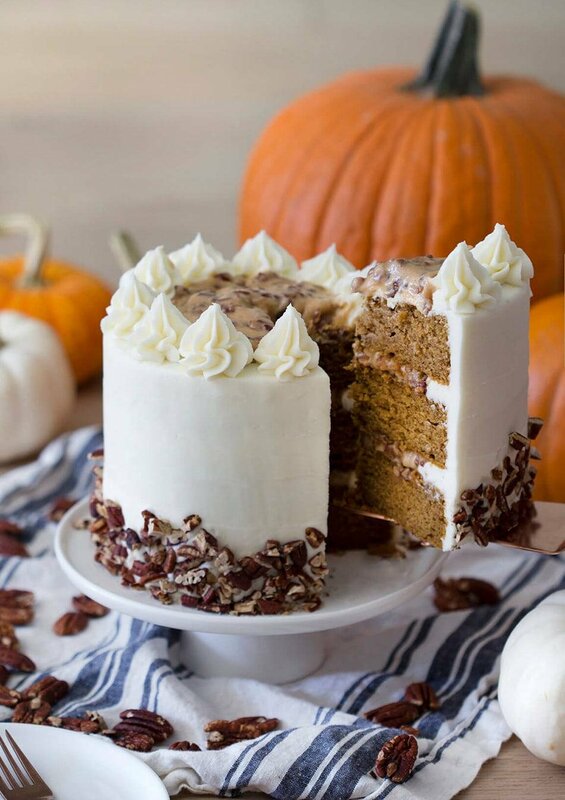 Moist pumpkin cake paired with a caramelly pecan frosting and vanilla buttercream. In a mixing bowl, beat together the eggs, sugar, oils, sour cream, vanilla and pumpkin. Sift together the flour, baking powder, salt, baking soda, salt and spices; add to wet ingredients and mix thoroughly. Bake for approximately 25 minutes or until centers firm up. Preheat the oven to 350 degrees. Place the pecans on a baking sheet and bake for about 8-10 minutes or until lightly browned and fragrant. Remove from oven, cool, and then chop fairly fine. In a medium saucepan, combine the sugar, milk, egg yolks, butter, and salt. Cook over medium heat, stirring constantly, and when the mixture begins to boil and thicken, remove from heat (about 5 minutes). Stir in the chopped pecans, and vanilla extract. Let cool until spreadable (about 30-60 minutes). Whip the butter for about 5 minutes, using a paddle attachment (stand-up mixer). Pipe a circle of vanilla buttercream along the perimeter of the cake. 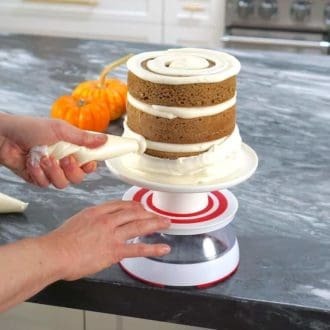 Use an ice cream scoop to add pecan frosting to the center of buttercream circle. Do this between each layer. Cover the cake with a thin crumb coat. 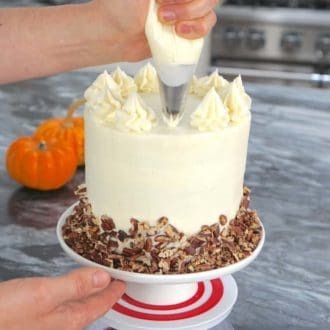 Cover the cake with the buttercream and smooth with an offset spatula. 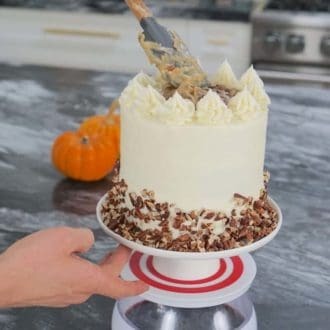 Using a large closed star tip, pipe dollops around the top of the cake. 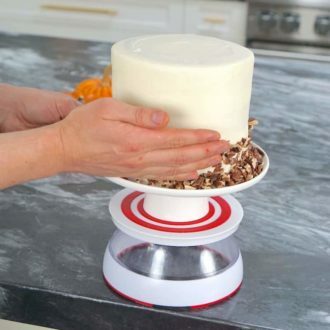 Scoop pecan frosting into the middle circle. Add toasted pecans to the bottom. Use 1 cup toasted pecans! Hope you enjoy the cake! You should be fine baking 2 days in advance! Just bring everything to room temperature the day of. You may need to whip the buttercream! Hope you enjoy this cake! Thank you so much for taking the time to reply! I am wanting to make this foe Thanksgiving and wanted to know if you think substituting sugar with stevia would taste ok. Cooking for 2 family members with diabetes abs wanted them to enjoy as well. Thanks! Unfortunately, I do not have a lot experience baking with stevia. I have read that stevia can taste a bit sweeter than real sugar, which could complicate the taste of the cake! Sorry I couldn’t be more helpful! Happy thanksgiving! Do you think this cake would pair well with a cream cheese frosting? Cream cheese frosting sounds like a lovely idea! Hi John I don’t have coconut oil is there anything I can use as a substitute. Use vegetable oil instead of coconut oil! Hope that helps! I wanted to try this cake with a different frosting buttercream frosting is a bit too sweet for me is it ok to use the marcapone frosting you had in your blackberry cake? or would it make it taste different? How deep are your baking tins? I made mine in two layers with an 8inch pan. I made a cream cheese frosting hybrid mixed with whipped cream. Scrumptious! I was wanting to make this cake into cupcakes. Do you know how many cupcakes this will make?